Correction fluid is a liquid product designed to cover mistakes made while typing, hand writing, or photocopying markings on paper. Typically, it is applied to paper using a brush. When it dries, it forms a solid film that effectively covers the error and allows the correct mark to be written over it. Correction fluids are composed of pigments, polymeric binders, and solvents that are mixed together in large batch tanks. First developed during the late 1950s, correction fluid formulations have steadily improved over the years. The need for correcting mistakes made during writing has been around for as long as writing itself. While erasers worked well for pencil marks, they did little to remove mistakes made with a fountain pen, type-writer, or ball point pen. At some point, it was realized that a mistake could be covered using an ink that was the same color as the paper. This led to the development of the first correction fluids. These fluids were typically white inks. These products were inferior because they did not match the paper color very well, took a long time to dry, and were difficult to write over. 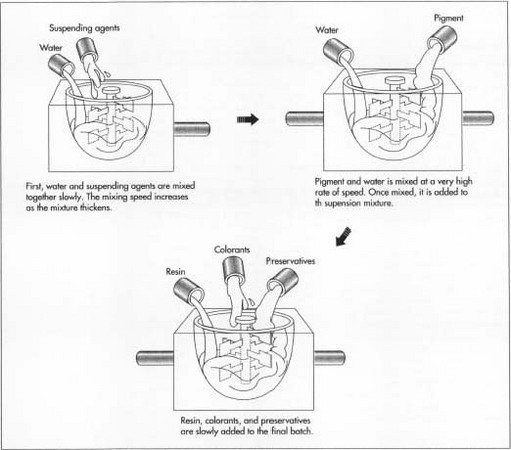 Correction fluids were greatly improved during the 1950s when polymer technology was utilized. This allowed production of a product which would adhere better to paper, spread easier, and remain flexible when dry. Over the next 40 years, a variety of patents have been granted which show how steady improvements have been made in correction fluid technology. Correction fluid is a liquid product designed to cover mistakes marked on paper. It is typically sold in a small jar with a brush applicator and works in much the same way as paint. First, the fluid is applied to the paper over the errant mark. Then it forms a film, which bonds to the paper fibers. This film is an elastic polymer that is both strong and flexible. Fixed in this film are pigments, which are supposed to match the color of the paper and cover the incorrect ink mark. When the film is dry it can be written over. A variety of correction fluid products have been developed for different applications The most common types are those designed to be used on standard, white typing paper. These formulas are typically white and designed to dry relatively quickly. Other fluids are available for special types of paper. For bonded paper, correction fluid formulas are made which give a different texture when they dry. This makes the correction less noticeable. For corrections on paper that is not white, various colored correction fluid are available. Products are also available for photocopying applications. These formulas are made with special additives that reduce the reflection of light off the film. While the standard product is sold in a plastic jar with an applicator brush built in the cap, this is not the only kind. Some fluids are sold in a pen, which uses a roller ball applicator. These products give better control over the application and the amount of fluid used. Other correction fluid type products are sold as solid films. These products are designed to be placed in front of the typing hammer of a typewriter. When the type-writer hammer hits the film it transfers the correction formula onto the paper in the exact shape as the letter providing a perfect coverup. As computers gradually replace conventional typewriters, this product will be used less frequently. Before a correction fluid can be made for the first time, a formula must be developed. This is done by trained chemists who are knowledgeable of a variety of raw materials. These scientists begin by choosing what characteristics are required for the fluid. They decide on functional features such as how long the product will take to dry, how strong the film has to be, and how stable it will be during storage. They also consider aesthetic features such as how thick it should be, what color it will be and how it will be delivered from the package. Often consumer testing is employed to help with these determinations. Preliminary formulae are first prepared in small beakers in the lab so the performance aspects of the formula can be evaluated. Tests for the correction fluid's effectiveness are done on these initial samples. Other tests may be run, including stability tests, safety tests, and consumer acceptance testing. Stability testing is used to detect physical changes in characteristics such as color, odor and thickness over time. It helps ensure that the product on the store shelves will work just like the formula created in the laboratory. Using the information obtained during this testing phase, the formula can be adjusted to produce the best product. There are many different types of ingredients that can be used to make a correction fluid formula. In general, the formulas are composed of an opacifying agent, a polymeric film former, a solvent, and other miscellaneous ingredients. The opacifying agent is a key ingredient in the correction fluid formula. It is the material responsible for covering the errant marking. The most common opacifying agent is titanium dioxide. This is an inorganic material derived from various titanium ores. It is an opaque material, which does not significantly absorb visual light. Since it has a high refractive index, it produces a predominantly white color. By changing the processing method and mixing the titanium dioxide with different materials, a variety of other colors may be produced. These are used for the different colored correction fluids. In general, the opacifying agent makes up from about 40-60% of the formula. Although the opacifying agent actually covers the error, a polymeric material is used to affix it to the paper. This polymer creates the film that strongly bonds to the paper fibers when it dries, or cures. The film is designed to be strong so it will stay in place, but also flexible so that it will not crack, flake, and fall off under normal conditions. A variety of polymeric resins can be used such as acrylic resins, petroleum resins, chlorinated polyolefin resins and even synthetic rubber. To make the optimal film, often a copolymer is used. One type copolymer system is a latex emulsion. This is made by polymerizing methacrylate with a nitrogen containing monomer in the presence of ethylene vinyl acetate. In a typical correction fluid formula, the polymer resin comprises 5-15% of the formula. To control the viscosity and dry time of the correction fluid, a solvent is necessary. In general, the correction fluid is made thin so it can be applied evenly and smoothly. The solvent works by diluting the formula and quickly evaporating to leave a dried film. Additionally, the solvent improves stability and helps to make the other materials in the formula more compatible with each other. In developing a correction fluid formula, the solvent must be chosen carefully. On the one hand it must evaporate quickly, so it can be quickly written over. On the other hand, it can not evaporate too fast or the polymer may solidify in the bottle. Two types of solvents are used including aqueous based and organic based. The aqueous based solvents are used for correction fluids that will cover oil based inks. They are typically a mixture of water and alcohol. Organic based solvents use volatile organic compounds (VOC) and generally dry more quickly than aqueous solvents. They are better for covering water based inks. A variety of organic compounds can be used including acetone, toluene, xylene, ethyl acetate, and methyl ethyl ketone. Some newer formulae include both types of solvents. These "amphibious"
type formulae are useful for all types of inks. Recently, environmental concerns have led to the development of formulae, which use little or no volatile organic solvents. The formula can be composed of anywhere from 25-50% solvent. A variety of other ingredients are added to the correction fluid formula to optimize stability and performance. Since titanium dioxide is not generally soluble in the solvent it has a tendency to settle out over time. For this reason suspending agents and dispersing agents are added. Examples of the former include hydroxyethylcellulose, xan-than gum or guar gum. Examples of the latter include phosphate esters, ethoxylated alcohol, and polysorbitans. Sometimes glass or metal mixing beads are included in the container to help re-disperse the titanium dioxide. In this case, the user has to shake before using. Other ingredients added include chelating agents that help protect metal parts in the applicator, defoamers that prevent excessive bubbling, and preservatives that prevent biological contamination. fluid is made and then it is filled into its packaging. The following description details the production of an aqueous based correction fluid. Other types are made in a similar manner. 1 The batches of correction fluid are made in large, stainless steel tanks which can hold 3,000 gallons or more. These tanks are equipped with mixers and a temperature control system. Workers, known as compounders, follow the formula instructions and add the correct types and amounts of raw materials at specified times and temperatures. Using computer controls, they can regulate the mixing speed and temperature of the batch. The correction fluid batch is made in three phases. 2 In the first phase, the main batch tank is filled with some of the water. The suspending agents and other miscellaneous ingredients are added at this time. Mixing is done at a low shear rate to get adequate dispersion without incorporating air into the mixture. As the suspending agent is hydrated, it thickens, and the mixing speed is increased. 3 A pigment dispersion is made next. This is done by adding the pigment to an amount of water and dispersing it at a very high shear rate. When the size of the particles is sufficiently small, it is slowly added to the main batch. In the final phase, the resin is slowly added. Additional ingredients such as colorants and preservatives may also be added at this point. 4 After all of the ingredients are added, a sample of the batch is taken to the quality control lab for approval. Physical and chemical characteristics are checked to make sure the batch falls within specifications outlined in the formula instructions. The quality control scientists run tests such as pH determination, viscosity checks, and appearance and odor evaluations. If the batch does not meet all of the specifications, an adjustment may be made. For example, if the color of the batch is off it can be adjusted by adding more pigment. After the batch is approved, it is pumped to a holding tank where it is stored prior to filling. 5 The filling operation is dependant on the type of packaging in which the product will be sold. 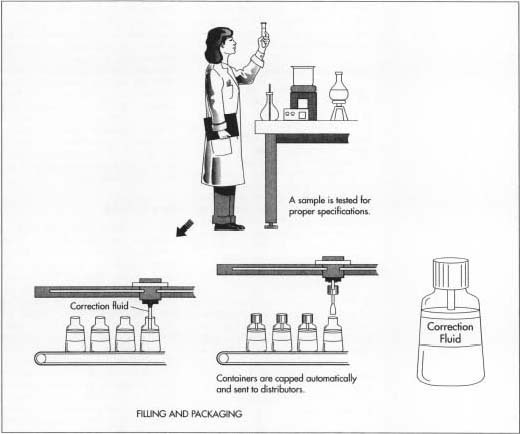 For the typical bottle of correction fluid the process begins with empty containers at the start of the filling line. These bottles are held in a large bin and physically manipulated until they are standing upright. They are then moved along a conveyor belt to the filling heads holding the correction fluid. 6 As the bottles pass the filling heads, they are injected with the exact amount of product needed. The bottles are then moved to a capping machine, which sorts the caps, places them on the bottles, and tightens them. At this point, the bottles may be passed through a labeling machine if necessary. The bottles are then put into boxes and stacked onto pallets for shipping to whole-salers and retailers. Beyond the quality control tests made during the batching process, other checks are performed during filling. Line inspectors are stationed at various points on the filling line, and they watch the bottles to make sure every thing looks right. They check for things such as label placement or filling weights. They would also see that enough finished bottles are packed into cases. Occasionally, product performance tests are run. For example, the opacity may be checked using a colorimeter. The flexibility and adhesion of the film may also be examined using a fold test. In this test, the fluid is applied to paper and allowed to dry. The paper is then folded numerous times and the film is checked for cracking and flaking. These types of tests are crucial to the production of a quality product. There are a variety of challenges facing developers of correction fluids. Many of the correction fluid formulas continue to have certain drawbacks. For example water based correction fluids are still prone to a problem called bleeding when used with water based inks. When this happens, the inks often show through the coating. The new amphibious formulas, which contain both a water based and organic based solvent, help alleviate some of these problems. However, these formulas will be more difficult to produce as governmental regulations require a reduction in the amount of volatile organic solvents used. Other formulation challenges include producing new colors, reducing drying time, reducing the incidence of product dry out in the container, and making the products less poisonous. New and improved forms of product delivery are also expected. Carraher, C. and R. Seymour. Polymer Chemistry. New York: Marcel Dekker, 1992. Kirk Othmer Encyclopedia of Chemical Technology. New York: John Wiley & Sons, 1992. I am facing the problem in making correction pen is that powder settle down in the bottom and so shaker ball is stuck in the bottom if the correction pen tube.